Inter-annual growth for January was boosted by the dynamism of Intermediate Goods (7.6%). 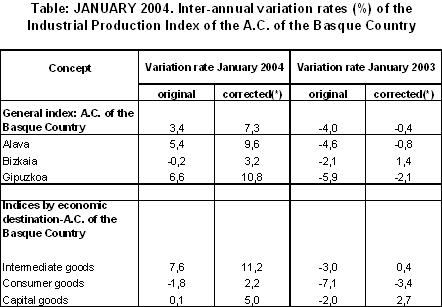 Industrial production in the A.C. of the Basque Country in January 2004 grew 3.4% in relation to the same month of 2003 in absolute terms, according to EUSTAT data. In homogenous terms of the working calendar, inter-annual variation was 7.3%, since January 2004 had one less working day than it did in 2003. The most positive inter-annual variations in January 2004, in absolute terms corresponded to the sectors of "Oil refining" (6.7%), "Chemical industry" (6.6%), "Timber industry" (6.5%), "Metallurgy and metal articles" (6.3%), "Non-metal industry" (6.1%), "Electric energy, gas and water" (5.6%) and "Electric material" (4.9%). By contrast, the sectors that experienced negative inter-annual rates were "Other manufactured" (-12.1%), "Metal and non-metal minerals" (-9.2%), "Paper, printing and graphic arts" (-3.0%), "Food industry” (-2.9%) and "Leather and footwear industry" (-2.6%). 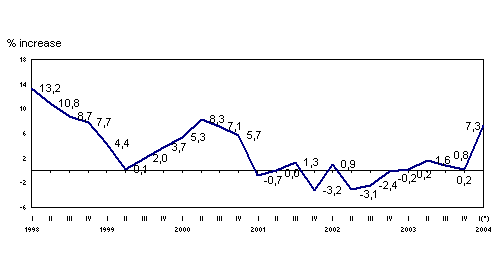 According to the classification of goods by economic destination, there was an important rise in January 2004 in the inter-annual rate for Intermediate Goods (7.6%), Capital Goods remained practically unchanged (0.1%) and Consumer Goods experienced a fall of almost two points (-1.8%). By province, inter-annual evolution of the General Index followed different rhythms, growing, in absolute terms, 6.6% and 5.4% in Gipuzkoa and Alava respectively, and registering a slight fall of 0.2% in Bizkaia. In homogenous terms of the working calendar, provincial growth was as follows: 10.8% in Gipuzkoa, 9.6% in Alava and 3.2% in Bizkaia.